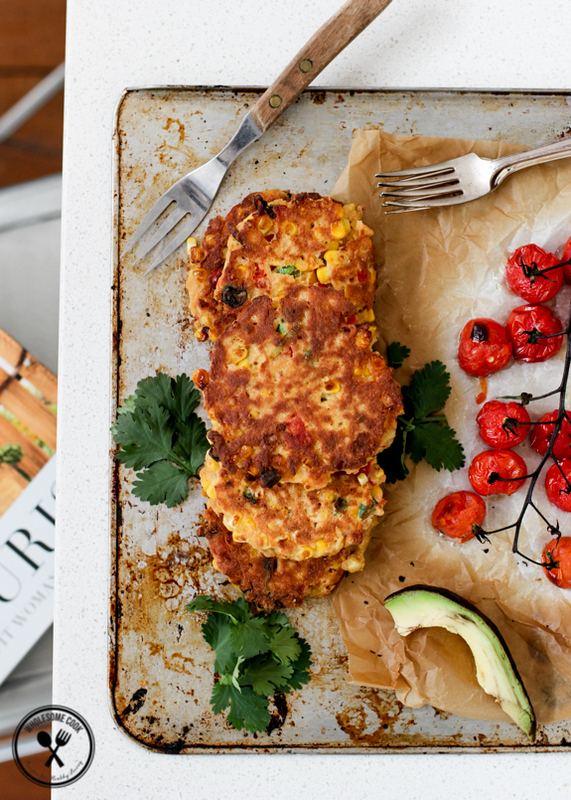 These gluten- and dairy-free Corn Fritters are an absolute breeze to make and oh so good to eat. 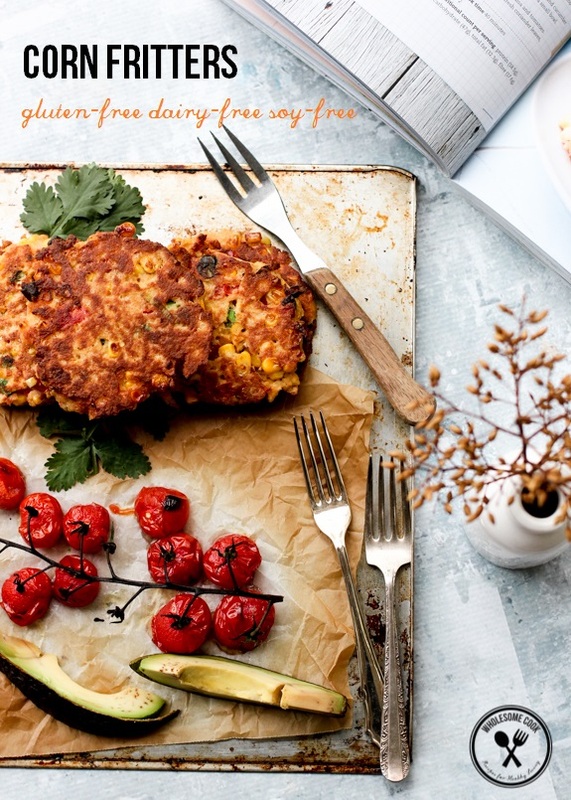 Adapted from Lorna Jane’s new book, Nourish, they are sure to become a family favourite. 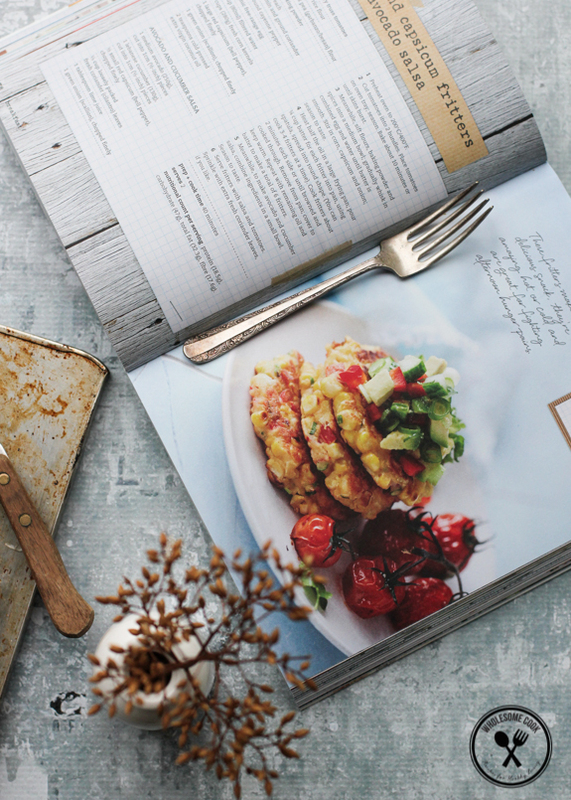 Stay tuned for a signed copy Nourish giveaway soon! Last night I attended my first #instameet and it was wonderfully educating, social and fun. There were cocktails, macarons and cake. Even a gingerbread decorating workshop. The night was organised by Blog Society and Little Paper Lane. Lovely, creative, amazing. It was held at the Sydney Williams Sonoma store, so I obviously made my way home with a big bagful of props. I can’t believe I managed to snap up so much on special. It was fantastic to mingle and chat food, saying hi to the usual suspects, putting faces to names and meeting a couple of Wholesome Cook readers. You know who you are – so nice to meet you! PS This one’s for you. 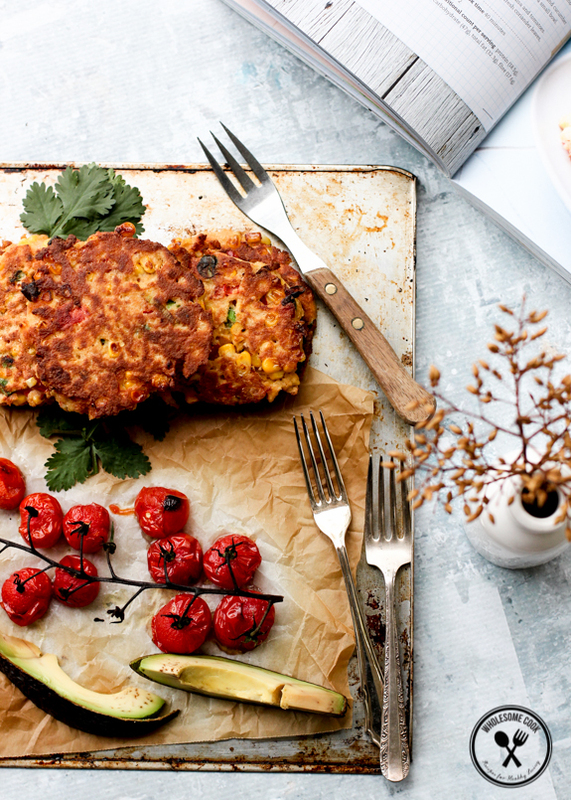 Or anyone else after a gluten-free and dairy-free corn fritter to die for. I admit I couldn’t resist and sprinkled them with some grated manchego. But you could skip that step or grate a couple of macadamias over the top instead. Nifty, huh? I have slightly adapted the recipe from Lorna Jane Clarkson’s latest book, Nourish. 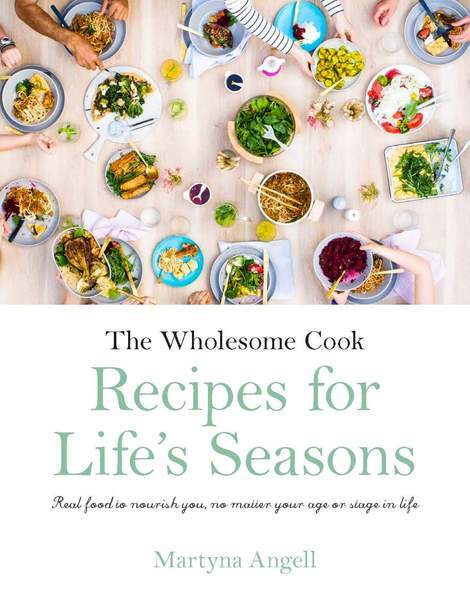 The beautifully illustrated gluten-free and whole-food based cookbook follows the move.nourish.believe mantra and provides plenty of tips for a more active and balanced living. It’s very much in line with my own wholefood philosophy in that it’s not forceful in one way or another. Sure it’s gluten-free, but reducing gluten in some dishes might actually be beneficial if you’re already eating plenty of bread or pasta. More about the book and your chance to win a signed copy coming up soon. And these fritters? Well, they are an absolute breeze to make and a delight to eat. Seeing how easy they are to make, I wondered, why I haven’t made corn fritters before. Perhaps I was waiting for the right recipe book to get me inspired. Well done Ms Clarkson. I like it a lot! My only tip here would be to use a larger than you might think necessary fry pan. Otherwise flipping these slightly delicate things will be as easy as giving a labrador a bath in a tea cup. Adapted from Lorna Jane Clarkson's Nourish. I used coconut flour in this recipe instead of chick pea flour because that's what I had on hand. While I divided most of the ingredients by half, I added an extra egg. Love eggs. Instead of salsa, I served mine with a few "rescued" avocado wedges and shaved Manchego cheese. For a completely dairy-free version skip the Manchego in favour of grated macadamias.You could also serve these with smoked salmon or poached egg! My only other tip here would be to use a larger than you might think necessary fry pan. Otherwise flipping these slightly delicate things will be as easy as giving a labrador a bath in a tea cup. Sift flours and spices into a medium bowl. In a separate bowl or jug whisk together water and eggs until well combined. Pour egg mixture into the flour bowl and mix well to combine. Add corn, chopped capsicum and spring onions. Mix well. Heat about 2 tablespoons coconut oil in a large skillet over medium heat. Using a 1/4 cup spring-loaded ice cream scoop or spoon, ladle the batter into the hot oil, flattening out into rounds. Cook for 2-3 minutes on each side. Flip carefully and cook for another 2 or so minutes, or until browned. Serve hot (or cold) with roasted tomatoes, avocado wedges, coriander leaves and a little grated cheese or macadamia nuts. Store leftover fritters in an air-tight container in the fridge for upto 2 days. Oh how wonderful. I’ve never been to a social media meet up, I’m too scared I think. But it sounds like you had a delightful time. And oh my would you look at that breakfast. LJ is a fantastic role model to Aussie women. Love the look of these and the sound of her book. I adore Lorna Jane clothes and have bought the book already, but I love your interpratation of the recipe too. It sounds delightful with the toppings you’ve suggested. Thanks for sharing the love. Go LJ! I apologise profusely for this being my first comment – I will be sure to pop a note in each time you’ve inspired a creation in my kitchen!! Looking forward to meeting up again soon. 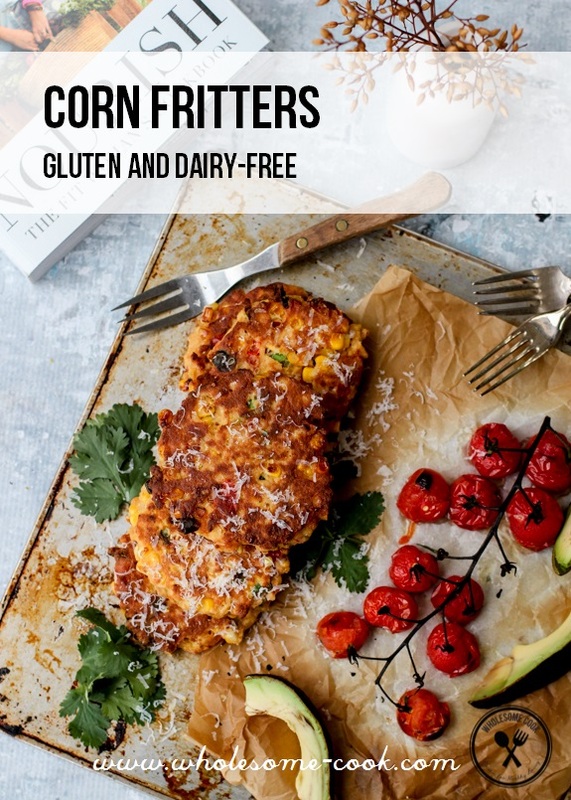 Our kids love fritters – this is fantastic. Love your last remark. Made me laugh SO hard! Great Aussie icon and a fantastic recipe. Will be additing this to my gf df repertoire for morning tea and brunch for sure. Can’t wait for the giveaway! 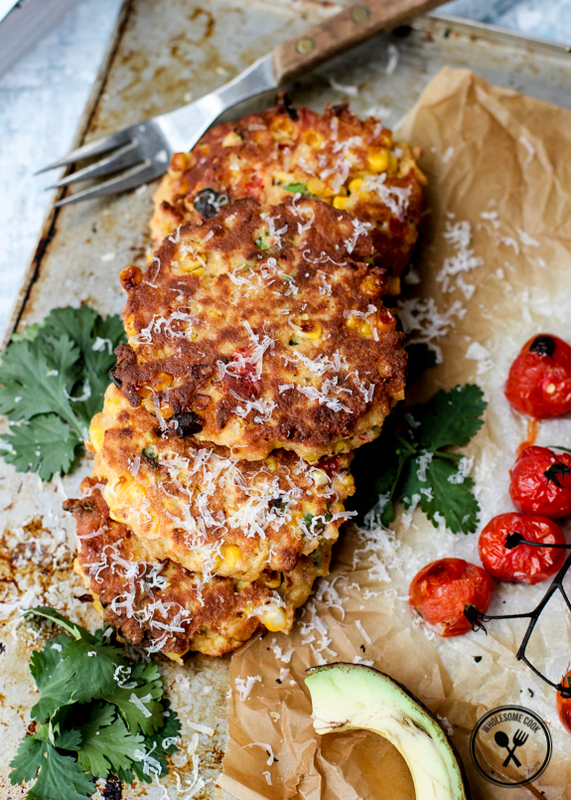 That meet at Williams-Sonoma sounds like fun but those corn fritters win my heart. 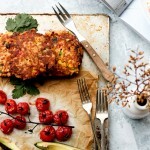 These look incredible, and I love your gluten and dairy free recipes! Cant wait to try these out, its winter here but I bett they’re great no matter the season!